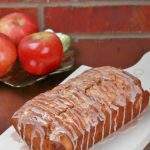 Enjoy the fall season with the seasonal Apple Fruit. 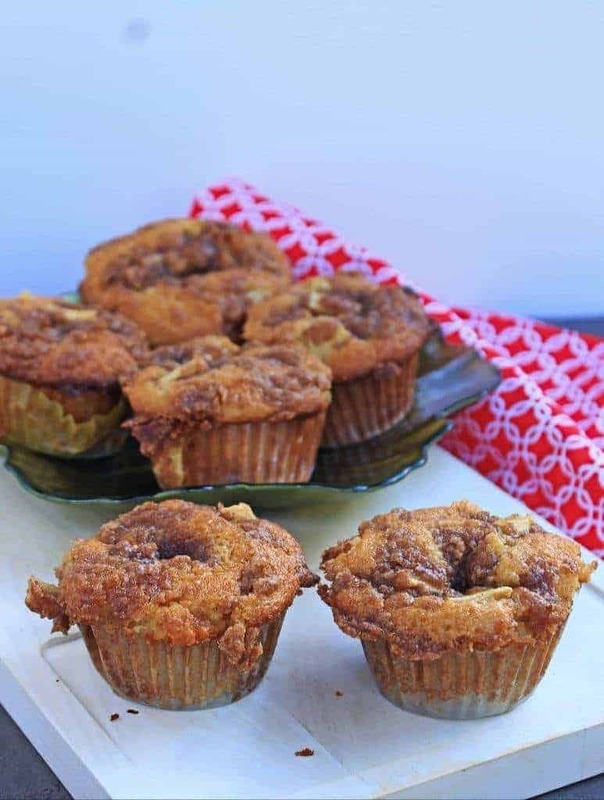 Do not miss the Cinnamon Apple Crumb as the topping for these delicious muffins. 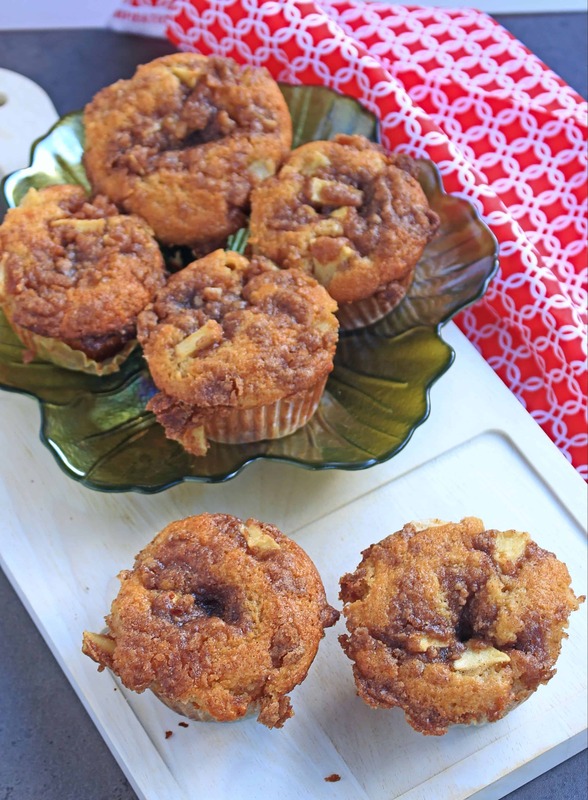 These Apple Muffins with Cinnamon Apple Crumb is the perfect recipe for this fall season. We just blinked and the summer just zoomed by and we are in the fall season already. The weather is turning a tad bit chilly and this is the time for fall decors, Halloween, Apples and Pumpkin. Depending on where we live the fruits and vegetables for that particular region vary, but over all for me nothing talks fall weather more than apple and pumpkin. It has been 4 years since we moved from NY to Oklahoma. We love Oklahoma, but there are still few things that we miss from back in NY. 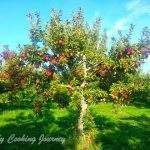 Apple picking is one the top of the list and it is something we all as a family miss in Oklahoma. The apple farms were plenty in NY and there has been no fall when we did not go apple picking. I mean, the apple orchards were less than 15 minutes away and they were loaded with apples. It used to be a very memorable event every fall and we would look forward for months to go apple picking. We came back home with a huge sack of apple and then began the struggle of figuring out, how to use the apples that we picked. 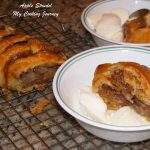 Over the years I have made several recipes with apple and here is a list of apple recipes that I have in the blog. To reminiscence our memories, today I have an apple recipe for the theme ‘recipes using seasonal produce’. I made aromatic and delightful Apple Muffins with Cinnamon Apple Crumb. We all love muffin in our house and I love baking muffins. 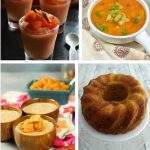 I have quite a few muffin recipes in the blog and I still don’t get tired of them. 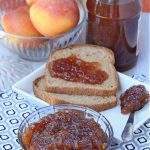 This is a simple recipe and is perfect for breakfast on the go or for after school snack. I have made this as an egg less recipe and have used yogurt and apple sauce. I also used part whole wheat pastry flour and part All Purpose flour. If you don’t have whole wheat pastry flour, you could just use the whole wheat flour or use just the all purpose flour. The texture of the muffin was just awesome and perfect than the bakery ones. I used gala apples in the recipe. Use any apple that you have or like. The crumb topping for the muffin is optional, but I would highly recommend it. If you are not making the crumb topping, then increase the sugar quantity of the muffin a bit more. In a medium bowl, combine the flour, brown sugar, cinnamon and cubed butter. 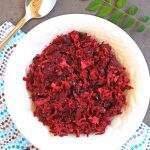 Using a fork or your fingers, gently mix the ingredients to combine. Peel the skin off the apple and chop them into small pieces. 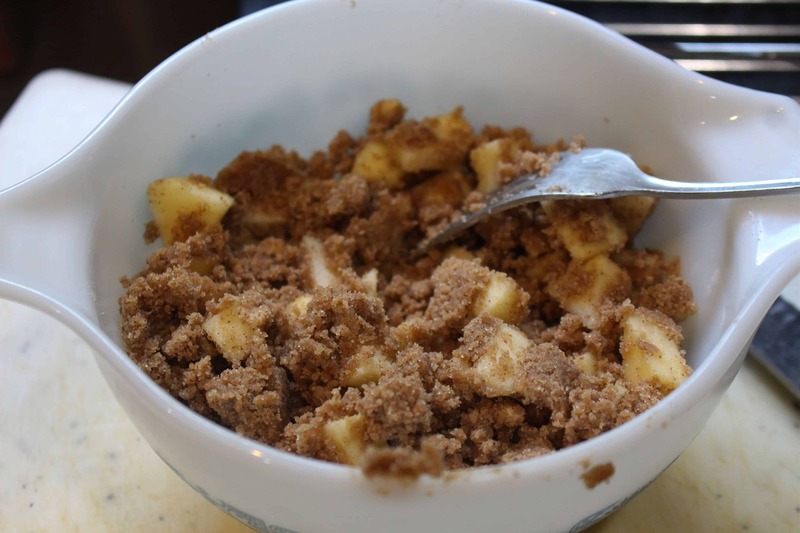 Add 1/4 cup of apple pieces to the crumb mixture and mix well to combine. Keep it aside until ready to use. Combine the flours, salt, baking powder and baking soda and sift them together in a bowl to combine. Wash and peel the apples and chop them into small pieces. Preheat the oven to 375 F. Line the muffin tin with liners if using and lightly grease them. In another large bowl, add the yogurt, oil and sugar and whisk well to combine. Add the apple sauce and vanilla extract and mix again. 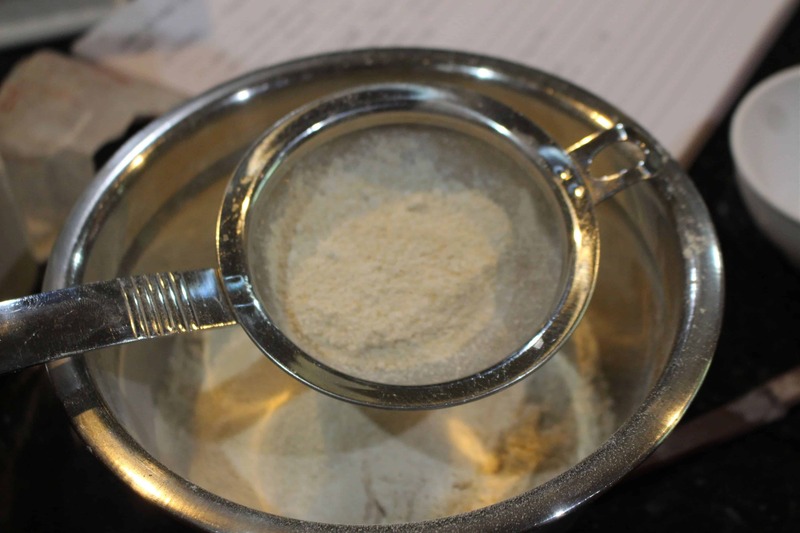 Now add the flour mixture in couple of batches and gently mix to combine. Do not over mix as this will cause the muffins to become dense. Add the chopped apple pieces and gently fold it in. Fill the prepared muffin tin with the batter. The batter should be perfect to make 12 large muffins. Sprinkle the crumb topping evenly over the batter . Bake the muffins for about 17 to 20 minutes or until the muffins are golden brown and the toothpick inserted in the center of the baked muffin comes out clean. Remove the muffins on to a cooling rack and let it cool slightly before serving. Such an incredible muffins, especially that cinnamon apple crumb topping, awesome and beautiuful muffins to pack in anyone’s snack box.. Well done Sandhya. 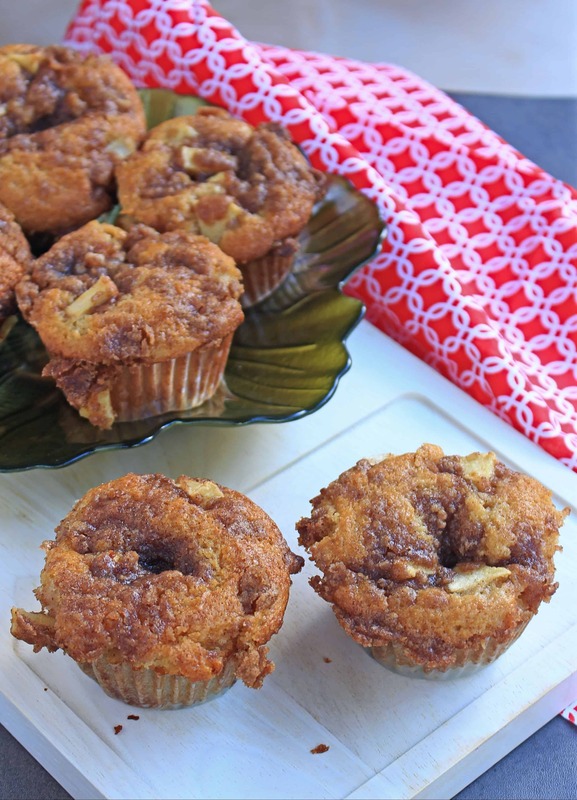 These are such delicious muffins with apples. I love the crumb so much. Perfect treat for all apple lovers..
Apple Crumble Topping looks so delicious. Cinnamon and apple are always a perfect match. We are left holding memories in life Sandhya! We cherish the happy times we have left behind. As for the apple muffins, these must have taken you and your family back to NY. Sound delicious. 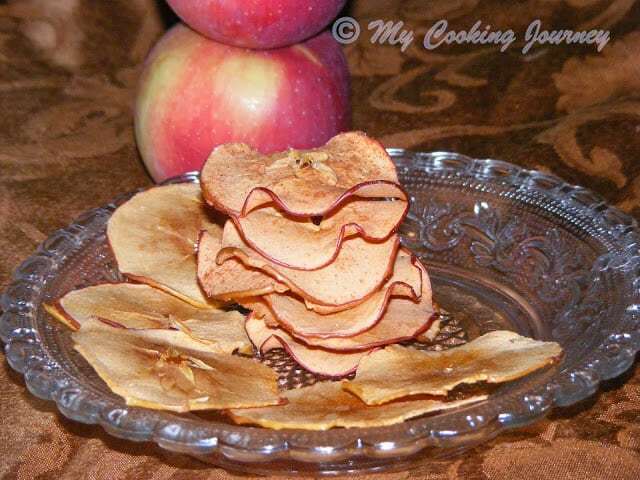 I love the flavors of Apple and Cinnamon. These cinnamon apple crumb muffins look so delicious. 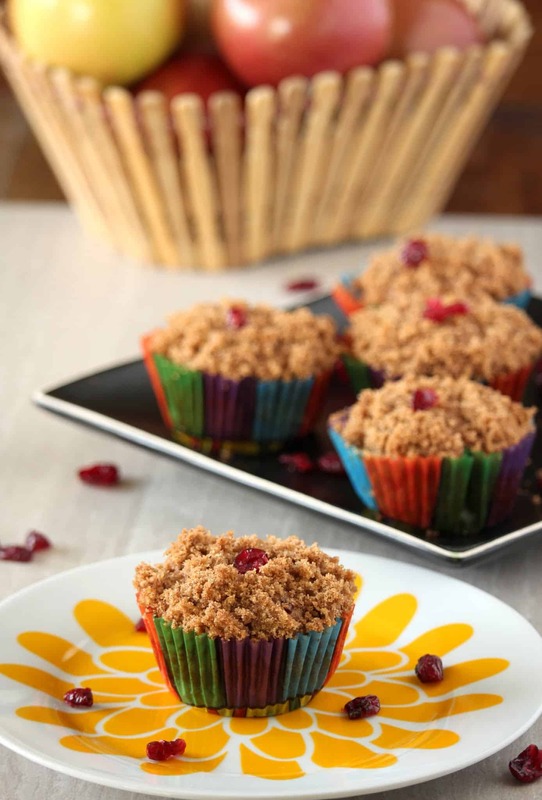 These muffins look amazing Sandhya, I keep reading about the apple picking so much that I wish I could do sometime..so natural you guys miss that!..do send this for the kids party Sandhya! Such a perfectly seasonal recipe. Your apple muffins look moist and absolutely delicious. That crumb topping make it extra special. 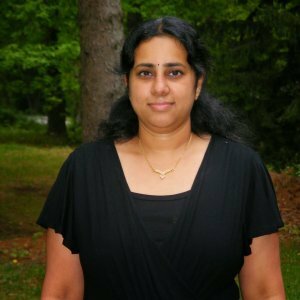 bookmarked to try, Sandhya ! 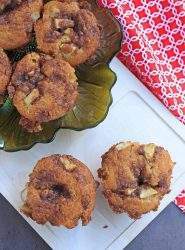 we love apples and muffins in equal fervour 🙂 thank you for an egg free recipe, esp loved that crumb topping 🙂 you sure have a delectable collection of apple recipes there ! Those apple muffins look amazing Sandhya. 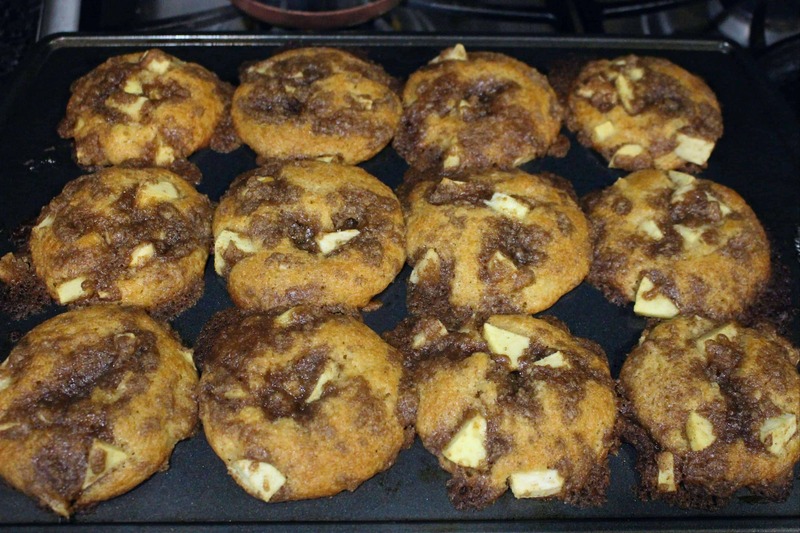 Love the combination of apple and cinnamon….bookmarking to try!! An apt pick for the season. That crumb topping must have made these yummy muffins extra special. 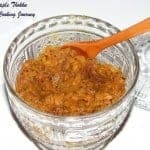 looking nice, apple and cinnamon is a made in heaven combination. So aromatic and enhances the flavors. Surely this will make a breakfast or snack recipe. Actually if once u lived in NY none of the places feels better afterward. Those muffins looks yumm sandhya! i too have loads of apple post navrathri, muffins are an easy way to sell apples!!! 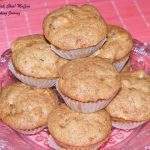 I love apple and cinnamon combo in muffin.. so amazed and moist muffins.